Third in a release of the vintage line, the successful - CA Rated 93 - Vintage '90 and '92 is followed up by the 1999, a mild body Connecticut Shade example of their skill and expertise. 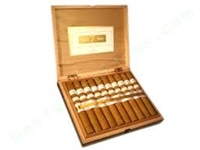 Utilizing a 7 year old Connecticut wrapper leaf, the carefully selected Dominican and Nicaraguan Long-fillers have 8 years of age to their own credit, ensuring this to be a very unique cigar. This combination produces a hearty, slightly spicy cigar with buttery creamy notes of wood, nuts and coffee giving this cigar just enough pickup to to pair with your morning coffee!